In the frozen moment of an exploded circus a new world unfolds; where risk becomes habitual, trust a necessity and the women left to deal with the impact build a new normal; making their own order out of the chaos. Mimbre are developing an all-female production celebrating the physical prowess as well as poetic possibilities of a fusion of circus skills. The ensemble work and movement style that Mimbre is famous for will stay at the core of the production, combined with the exceptional and the spectacular. The thrill of circus will be amplified by human characters and an intimacy between the performers and audience. Working with a breath-taking, immersive design, the stage will hold the epicentre of an exploded circus – with everything from the circus ring, chairs, sequins and fair-ground horses caught in mid-air; a high visual design that is still practically developed with touring in mind. We plan to work with live musicians physically integrated into the performance, jumping, flying and falling while playing the tune - while acrobats' toes, heads and hands get active in creating the music. We will celebrate the strength and gracefulness of the female circus performers in equal measure and let the stories and characters grow out of the expressive physicality of the highly visual circus language. 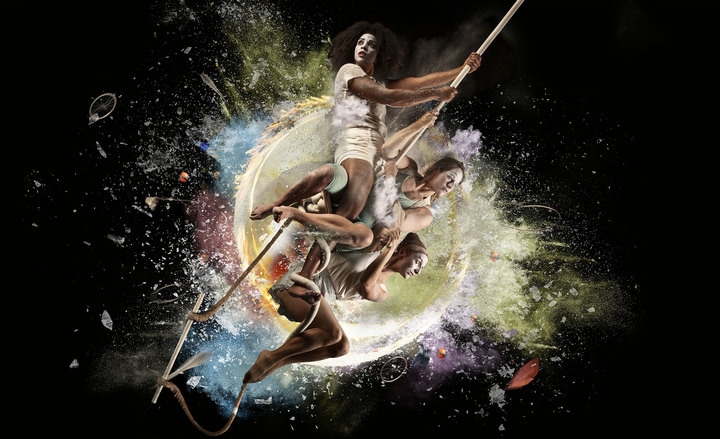 The Exploded Circus is being developed with six of the UK's finest female circus performers, stunning production design by Loren Elstein and an original, interactive score by Quinta. We have had an R&D at Unit 101 in Newbury and are now speaking to venues about 2018. Our main rehearsals will happen in early 2018, with set construction happening in late 2017. We intend to tour from spring 2018. Co-commissioning and pre-bookings, co-producing partners. We are developing a design of a self-standing rig built out of scaffolding poles and truss made out of a mix of aluminium and steel. The rig would hold all the design element as well as the weight-bearing aerial circus equipment. The rig would be secured either through floor points (where possible) or with water ballast.